Be the voice for rhinos and tigers. Tell Congress that our planet’s most at-risk wildlife can’t afford to be left defenseless. In a shortsighted attempt to cut the federal budget, the House of Representatives is poised to slash funding--by more than half--for government programs that help save rhinos, tigers, elephants, great apes and marine turtles. These severe cuts would make it even more challenging than it already is to prevent these incredible animals from being driven to extinction. It is not too late to turn this situation around. Urge your members of Congress to restore funding to these essential wildlife protection programs. The numbers alone drive home the dire need for this funding. 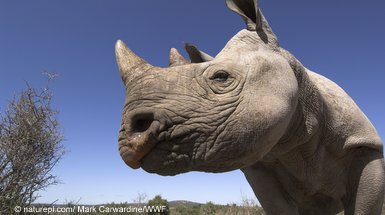 Rhino poaching in South Africa has increased 3,000 percent in just five years. More than 200 elephants were massacred in Cameroon this past winter by heavily armed gangs of ivory poachers. And now, some in Congress are pushing to cut programs to save these animals by more than 50 percent. All of these numbers are moving in the wrong direction. Take Action: Tell your representatives in Congress to restore funding to the Multinational Species Conservation Fund so that these critical programs can continue. The Multinational Species Conservation Fund (MSCF) currently receives less than $10 million a year to support species-saving efforts across the globe. Despite these limited resources, the program has achieved major successes. Supported by the MSCF, WWF helped eliminate rhino poaching in protected areas in Nepal in 2011, dramatically reduced poaching of marine turtle nests in Costa Rica, and generated jobs and income for communities in Central Africa through gorilla-based tourism. It is up to your members of Congress to ensure that these programs continue. Make sure they understand that our planet’s most at-risk wildlife can’t afford to be left defenseless.